Sometimes training your dog can seem down-right daunting. I meet a lot of pet parents who feel that Fido’s behavior is just part of his personality and they have given up on a lot of the goals they had set when he was young. If your dog is an adult or has practiced undesirable behaviors for a long time you may be asking yourself, can an old dog learn new tricks? Young dogs are very impressionable and eager to learn new things. Re-training an older dog that has practiced a lot of “self-rewarding” behaviors can seem like a big task. What if I told you all you need to do is find the right motivation and do some goal setting? Older dogs are very capable of learning new tricks, skills and behaviors. Some adult dogs have learned all of their people’s tricks so you may need to change your approach to properly motivate them. You can change any habit; you just have to be direct about it. New pet parents put a lot of thought, time and effort into training their dog. They go to more classes and are eager to seek help and advice. So it comes as no surprise that we all have this idea in our head that young dogs are more capable of learning new things and overcoming behaviors than older dogs. When dogs are young, people give them the benefit of the doubt. They will say things like “he will grow out of it”. Truth be told, dogs are creatures of routine and are more likely to “grow into behavior” than grow out of it. While routines are good for both dogs and people they can make us seem boring and predictable to dogs. It might be time to shake things up a bit. Consider what motivates your dog. This might be a toy, food reward, game or even a favorite person. 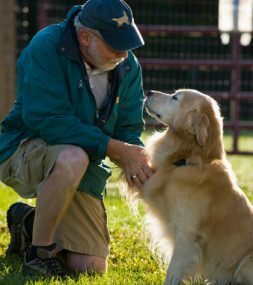 You can use these rewarding things to train an older dog to work for you, learn new skills or re-write old behaviors. Let’s do some goal setting; you need to think about the behaviors you don’t love and what you would like your dog to do instead. If your dog pulls on the leash, erupts with barking when the doorbell rings or cannot stay for more than 30 seconds it may be time to start over. You don’t need a lot of time since you already have a relationship. Make a commitment for 10-20 minutes a few times per week to work with your dog and motivate them to learn something new. Making this commitment will help improve your dog’s behavior and strengthen your bond. Think of the routines and time you already commit to your dog in your daily activity like feeding, walking, petting and play. You can use all of these as training exercises to build good habits. Start with some fresh motivators like new food rewards or go get a brand new toy that is different from the old ones. Only use these rewards for your special training time. Excite your dog and remove these special motivators when you are not working together. Reward good behavior frequently. The trouble with older dogs is pet parents have come to expect good behaviors, so perfect dogs are often ignored and dogs acting up get a lot of feedback. Even negative attention is attention. The best way to reinforce is always reward your dog’s good behavior quickly and appropriately. This can be treats, verbal praise, petting or extra positive attention. Set goals and celebrate small victories the same way you would if he were a young pup. Be forgiving and patient and most importantly don’t give up on an old dog. With a bit of time and attention, even the oldest dog can learn new tricks.